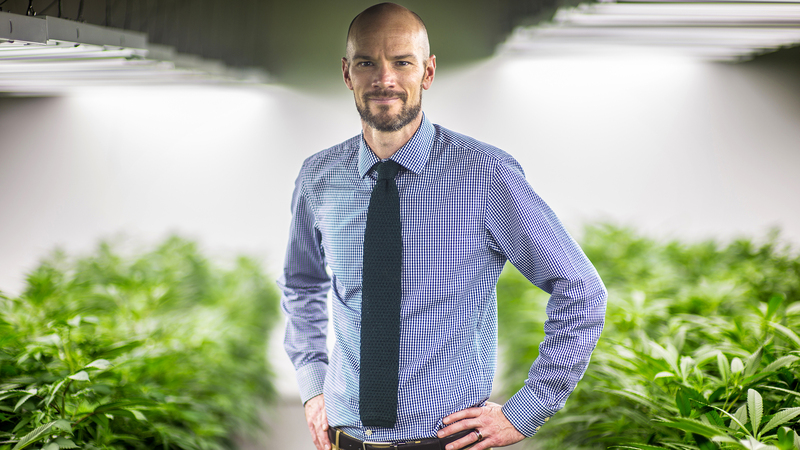 When Brian Vicente ’99 graduated from law school, some of his professors told him that the field of marijuana policy would be career suicide. Instead, Vicente turned it into a career path. After building his nonprofit organization into a force for marijuana policy change, Vicente went on to co-author the law that would make Colorado the first geographic area in the world to legalize and regulate the possession, sale, production, and distribution of adult-use marijuana. In November 2012, the Colorado law known as Amendment 64 passed by a 10 percent voter margin. Vicente not only was instrumental in crafting the language and co-chairing the Amendment 64 campaign, he led the 2013 campaign that shaped the law’s tax policy. Calling itself “the marijuana law firm,” Vicente Sederberg LLC is the banner under which Vicente advocated for legalization and now advises marijuana industry clients. In this interview, Vicente talks about his trailblazing journey. How did you, a psychology major at Grinnell, become interested in law and dedicated to the field of marijuana policy? After Grinnell I moved to Colorado to be a snowboard bum and to figure things out. I knew I wanted a job that would allow me to provide a public service and have a positive influence. For me, that broke down into two segments: direct services or broader policy change. Law seemed like a logical way to impact policy, and I ended up getting a full ride to the University of Denver law school. While there, I began to work on behalf of a medical marijuana patient and was able to assist folks in trying to shift the marijuana laws. That exposed me to individuals who were absolutely receiving medical benefit from using the substance. It led me to rethink all we’ve been taught about the drug war and that marijuana is a horrible substance. I began to think of it as a possible career path to advocate to change laws I thought were broken, so I founded a nonprofit organization called Sensible Colorado that tried to get funding to work on marijuana policy issues. I ran that organization for the first several years of my professional career and essentially became an expert on marijuana policy. I started the law firm in 2010 to advocate for these policy shifts as well as to represent marijuana businesses. The nonprofit entity is still around, but it’s sort of a unique animal in that we accomplished our mission. In 2004 our mission was to legalize marijuana in Colorado, and in 2012 we actually accomplished that. My priority now is to make sure that Colorado’s marijuana laws continue to be responsible in terms of their implementation. What we’ve done is remarkable in that we’ve shifted from 80 years of prohibition into this new era of regulating marijuana. Colorado is really the test case to see how that regulation is going to unfold, so a lot of my time is spent working with government entities and addressing any issues that come up with the legalization of marijuana. What’s the most challenging aspect of your work, the social/legal issues or regulation/taxation details? It’s all pretty interesting and intellectually stimulating. The challenge was that I essentially advocated for almost a decade to get us to the point where we are now, and I was running into opposition — from government, law enforcement, angry parents, what have you — that was resistant to change. We dealt with a lot of negativity. Ultimately, I think we presented a strong case to the voters that regulation was better than prohibition. Now, a lot of it is just ironing out the details, whether it’s taxation or whether local communities should allow these stores or not. You have been called “the marijuana industry’s de facto spokesman.” Has that changed your life personally and professionally? I wouldn’t say it has been a major change. When I graduated from law school and began working in marijuana policy, it was not considered a popular area to go into. Some people, including some of my professors, said it was career suicide and a mistake. But, for me, this is a social justice battle, and I felt like it was worth fighting. Over the years I’ve been fortunate to work with a great team. We’ve developed really strong policies here, and part of that involves advising newly licensed marijuana businesses and making sure they are responsible actors. In terms of my speaking on behalf of the industry, it’s really about demonstrating that there is a responsible face to this industry and having sustainable businesses being community partners going forward. Are you being approached to consult other regions of the country or the world where policies are being changed or about to be changed? We are being asked, and that is one of the really interesting and gratifying things. Prior to Colorado’s vote, I think the idea of marijuana legalization was very abstract for people around the world. When Colorado stepped forward with legalization, regulation, sales, and the licensing of businesses, it became real and it sort of crystallized in people’s heads. We get contacted weekly by elected officials and others who are interested in visiting Colorado and learning about our experiences in passing and implementing the law. It’s very heartening. We’re certainly aware that the eyes of the world are on Colorado. How did the law firm come to exist in its current form? With Sensible Colorado I got grant funding to do policy work, represent medical marijuana patients, and things like that. I ran the nonprofit — and the law firm for the first couple of years when it was only myself — out of the basement of the house I rented. It was not a glorious time, but again, we were building. In 2010, there were several hundred [medical] marijuana businesses that were not licensed at the state level. Our state legislature had a decision to make that year: Are we going to license these businesses and set up a regulatory framework, or are we going to ban them? So I got very active in the Capitol to push our legislature toward regulating the medical industry as opposed to banning it. At that point I partnered with a business law attorney, Christian Sederberg, and we carried forth together. For me, that moment in 2012 when we legalized marijuana represented an incredible and somewhat unprecedented coalescing of two things. You have massive social change — that is, the state deciding to legalize marijuana and begin unwinding the war on drugs — butting up against an opportunity for commerce. Colorado didn’t just decriminalize marijuana; we actually set up a licensing structure for people to sell and grow and produce marijuana. It is an interesting moment where those two exciting prongs are intersecting. How does the state stand to benefit from legalization and regulation? The way that we wrote Amendment 64 and the tax campaign that passed in 2013 is that the first $40 million of the excise tax goes to public school construction every year. Then there is a 15 percent sales tax additionally to fund the regulatory structure, as well as public education around marijuana. So we think there will be about $70 million of new tax revenue coming into the state coffers every year from these sales. That’s remarkable because marijuana had been sold for decades in Colorado, but that money was just going into the hands of the underground market. Now the state is collecting that money and using it for positive purposes. How have government and law enforcement officials reacted to Amendment 64? There has been acceptance in Colorado among law enforcement and government officials of this voter-approved change. Law enforcement certainly is not arresting people in large numbers for marijuana anymore, so I think we certainly have freed up law enforcement resources to focus on more serious crime. For years the largest opponent of marijuana legalization was the government, federal and local. We did not have much support for the change that occurred in 2012 from government officials, but I will give them credit. Since we won by a 10 percent margin, every wing of our state government has decided to move forward thoughtfully and responsibly with implementing this law and fulfilling the will of the voters. Our governor, John Hickenlooper, historically has not been a proponent of marijuana legalization, but to his credit, when this passed he committed to making it work and to push for banking solutions. He talked to the federal government about how to move it forward. It’s a very interesting legal shift. We have this dichotomy where marijuana is federally illegal but legal in certain states. Twenty-three states have medical marijuana, and four states (Colorado, Washington, Oregon, Alaska) now have legal marijuana for adult use with Colorado leading the way. It’s an interesting moment in time. How did your Grinnell experience influence you? To a certain extent my time at Grinnell was formative in terms of launching my professional career. I developed some critical thinking skills that led me to analyze policies, such as the drug war, and to think about solutions that maybe hadn’t been tried before, such as marijuana legalization, and to not be discouraged from moving forward with them. Also, Grinnell’s policy of self-governance had an impact on me and led me to think perhaps there are alternatives to some of the constraints on society and more positive ways to move forward.